This beautiful Letoyvan toy has great features to help bring to life the salty sea air and the quest for adventure and untold treasures. Fabric sails with 3 glow in the dark skull and cross bones, a plank to walk, an on-board prison, for all those people you and your pirate mates will capture, a crows nest, two rope ladders, an anchor you can wind up and an opening, drop down stern, for storage of all the treasure you are going to find. 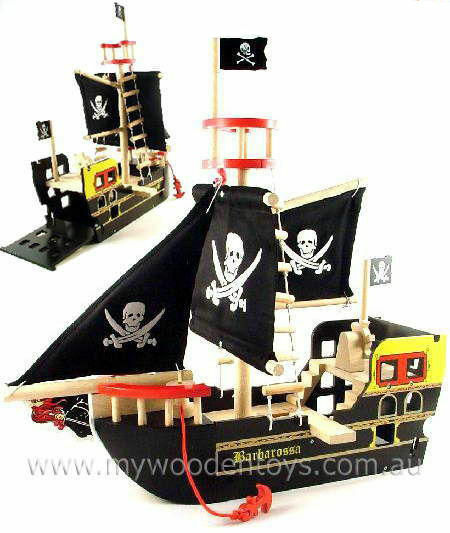 Very solid wooden toy bristling with features to excite and spark the imagination. Material: Wood, Elastic, Child -safe paint, Cotton sails, Metal screws. We like this because: "It is solid, well made and will easily survive the many many adventures it will undoubtedly undertake. Just looking at it makes you reach for the eyepatch and go Arrrrrrrrrr."